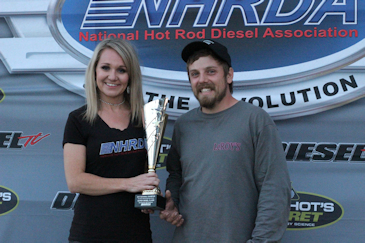 At the end of the season it was, rookie driver Nate Morgan of Sun City Arizona, who captured the 2017 Hot Shot's Secret Diesel Drag Racing Series ARP Super Diesel National Champion. Morgan and his 2005 Chevy traveled all over the country this past season chasing his first ever NHRDA National Championship. Nate had his hands full throughout the season as he battled it out with some of the best in the industry for the National Championship trophy.